New Chapter Removals approached as a start up about 2 months after LaunchLocal was created. We no longer deal with start up companies however this was a personal project as the business owner is a close friend of ours. 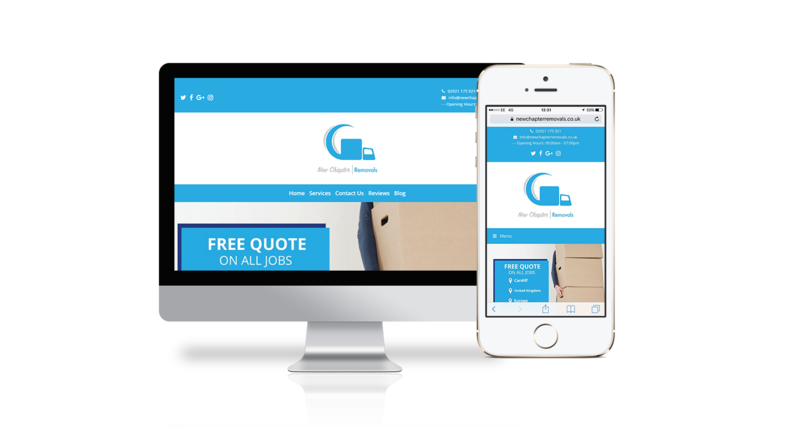 New Chapter wanted a website that stood out from the other Cardiff removal companies. He wanted to make it as easy as possible for customers to understand exactly what New Chapter offers and to make it a simple process to get in contact to book a free removal quote. The website has provided exactly what New Chapter Removals was looking for. An aesthetically pleasing, easy to use website with a simple CMS system. New Chapter is now going to embark on a Google Adwords campaign after an extremely successful first 12 months for the business. Please come back to this page for the results! I have known Kristian and Keenan for many years as we all went to the same school. So far they have built me a really nice website which all my customers comment on and I couldn’t be happier. Cheers guys!